Not many people can lay claim to an invitation from the president to decorate the Christmas tree at the White House. Palmyra’s Martha Hunsicker, 91, can, due to her work in the unique craft field of wheat weaving. In 1993, Hunsicker was invited by President Bill Clinton and First Lady Hillary to display one of her pieces on the Christmas tree during the Clintons’ first year in the White House. Her pastor later drove her to Washington, D.C., to see the tree in person. She was invited to help the Clintons decorate the tree, though she professes that she had to deny the invitation, which she humbly displays amongst her work. Hunsicker has been wheat weaving for more than 30 years, and her apartment is adorned with the fruits of her labor. Intricate, detailed works of art, ranging from angels, wreaths, Nativity scenes and “the little bell that gave me real trouble” are displayed around the rooms and in the office that she converted into her workshop. She is a member of the National Association of Wheat Weavers, which was founded in 1987. Hunsicker has been around wheat all of her life, growing up on her family’s farm in Nebraska, where she took part in the family business. She left Nebraska after high school for North Newton, Kan., where she attended Bethel College for two quarters before the passing of her mother prompted her to return to help on the farm. She later returned to Bethel College and received training as a nurse. At the same time she was attending, Hunsicker explained, the college president’s wife was picking up wheat weaving while on sabbatical in London. 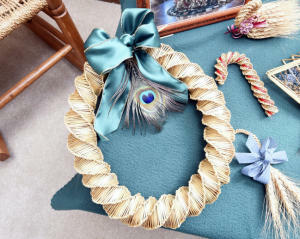 Wheat weaving, which has been dated to prehistoric times, made a recovery in England during the 1870s, when interest in the technique as a decorative art gained prominence. When the college president’s wife returned from her trip, she brought that interest back with her to the United States. But it was not at Bethel that Hunsicker started wheat weaving. She had always been interested in doing something with wheat, but it wasn’t until a friend showed her a piece she had made, known as a house blessing — a piece with a significant purpose — that Hunsicker began weaving. After that, she began collecting magazines pertaining to the subject and used them to teach herself the craft. She also attended a few informational and demonstrative seminars. It wasn’t long before she began to master the art and, after settling in Johnstown, began selling her works to a number of shops throughout the area. Hunsicker starts by having the wheat delivered from South Dakota. For her work, two kinds of wheat are used: turkey red and black beard. Turkey red wheat is a strain brought to the United States by Mennonites emigrating from Russia to the Midwest in the mid-1800s, which helped the region to earn its reputation as the nation’s breadbasket. Black beard wheat is golden wheat with a distinctive black beard surrounding the head. Hunsicker was also quick to point out that Pennsylvania wheat is not bearded. Once the wheat arrives, she removes the sheaf and joints from each stalk, then removes the head and beard, saving them for later use. The wheat is then soaked in water for 15-20 minutes, after which it can be woven immediately or frozen for later use. Fran Brandt, Hunsicker’s personal caregiver, is inheriting the craft from her, though she admits difficulties. She is impressed by Hunsicker’s ability to continue wheat weaving as part of her active lifestyle. There are also strikingly personal reasons for Hunsicker’s art. Hunsicker explained that in the Midwest, it was common for florists to carry arrangements of wheat to be placed on caskets. When her husband, Ira Gribbel, a pastor for Church of the Brethren, passed away in 1993, she began looking for an arrangement to place on his casket, but, after an extensive search, could not find any available. She then decided to make her own arrangement and “worked very fast” to complete the piece in time, a feat she had at first thought to be too burdensome. Brandt would agree, thinking back to one of the lessons she Hunsicker had given her. In the end, Hunsicker confesses to a pleasure taken in creating art out of natural materials. For her, there is no limit to what can be done with the product. “Wheat is amazingly versatile,” she professed. To learn more about wheat weaving, visit the website of the NAWW at nawwstraw.org.